Over the last few months, the European Digital Forum has deepened and expanded its groundbreaking work towards empowering European web entrepreneurs and growing Europeâ€™s digital economy. Here is an interactive look back at recent initiatives and a preview of what is yet to come this autumn. We hope you will enjoy reading this newsletter, and thank you for your trust, support and engagement. Bringing together an eclectic community of top European tech entrepreneurs, venture capitalists, startups, think tankers, policymakers and digital aficionados, The 2015 European Digital Forum met under the timely theme How the Digital Single Market Will Power a European Renaissance â€“ and What We Need to Do About It Today. 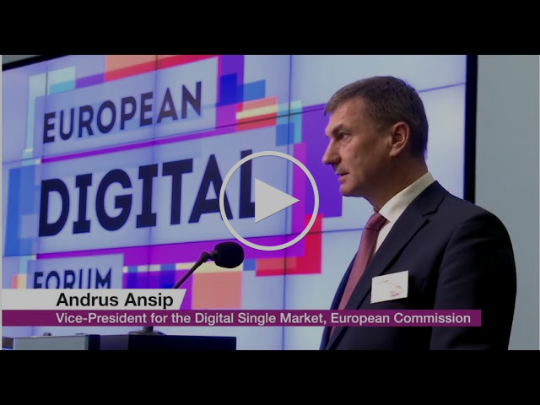 Andrus Ansip, vice-president of the European Commission for the digital single market, delivered The 2015 Guglielmo Marconi Lecture and laid out his vision of a European renaissance fuelled by dramatic leaps in the digital single market. 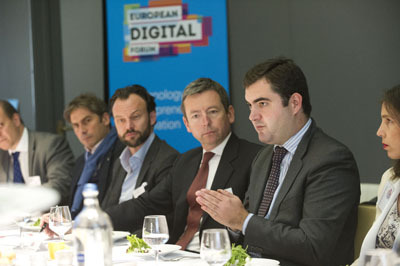 The European Digital Forum convened a High-Level Working Lunch on Making the Investment Plan and the European Strategic Investment Fund a Success. 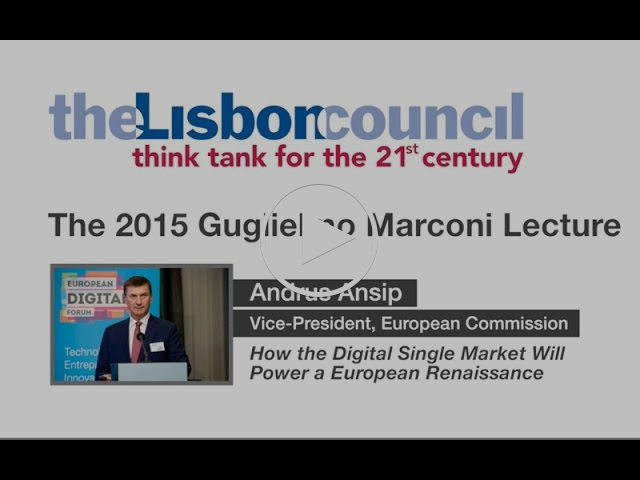 Marjut Santoni, deputy chief executive of the European Investment Fund, presented an array of ideas on how to make European Commission President Jean-Claude Junckerâ€™s â‚¬315 billion Investment Plan a success. Miguel Gil-Tertre, member of the cabinet of Jyrki Katainen, vice-president of the European Commission for jobs, growth, investment and competitiveness, served as discussant. 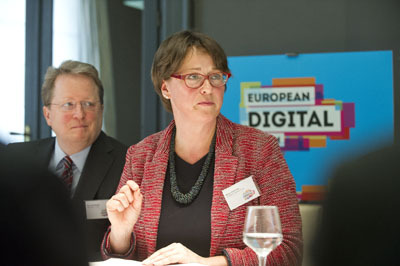 The European Digital Forum has formed a new body â€“ its Advisory Board. 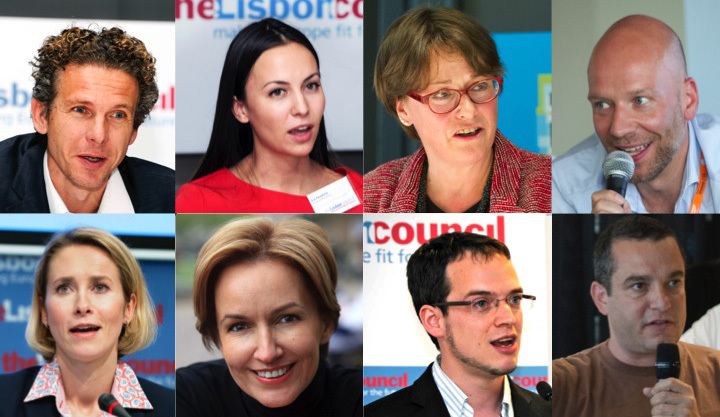 This august group of digital stars and thought leaders will help guide the work the think tank does to elevate the voice of web entrepreneurs and cutting-edge digital startups to the highest ranks of European policymaking. Among others, Gilles Babinet, digital champion of France; Xavier Damman, co-founder, Storify; Kaja Kallas, member of the European Parliament; Tom Kirschbaum, co-founder and chief operating officer, Ally; Saul Klein, partner, Index Ventures; Gergana Passy, digital champion of Bulgaria; Eva Paunova, member of the European Parliament; and Marjut Santoni, deputy chief executive, European Investment Fund, joined the Advisory Board. 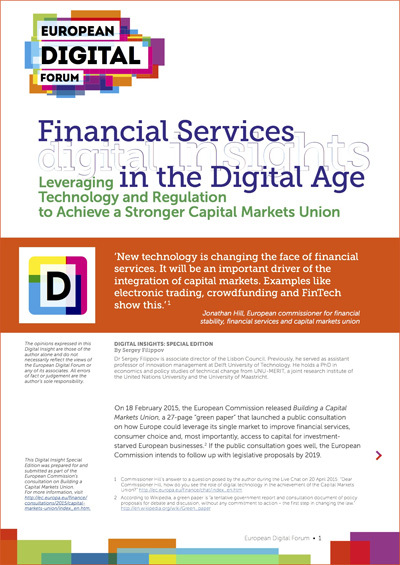 In a new policy brief, Associate Director Sergey Filippov looks at Financial Services in the Digital Age: Leveraging Technology and Regulation to Achieve a Stronger Capital Markets Union. The paper examines the spread of digital technology throughout the financial-services arena and the rise of new and innovative services such as crowdfunding, blockchain technology and data analytics. It concludes that â€œIf the European Commission wants to make the Capital Markets Union a success, it must tap into the wealth of improved consumer services and greater access to funding opportunities that technology has brought.â€ The policy brief was a contribution to the European Commissionâ€™s public consultation on Building a Capital Markets Union that ran from February through May 2015. Startup Manifesto Policy Tracker â€“ Join the Community! Startup Manifesto Policy Tracker is an online tool for tracking the implementation of the 22 recommendations set out in the Startup Manifesto, an innovative blueprint for a more entrepreneurial Europe written by founders of world-leading technology companies based in Europe. The main principle of data collection is crowdsourcing â€“ the progress in the implementation of key policies is monitored by communities of web entrepreneurs, practitioners and policymakers. The European Digital Forum invites all interested parties to support this important work and provide their input in the Startup Manifesto Policy Tracker. 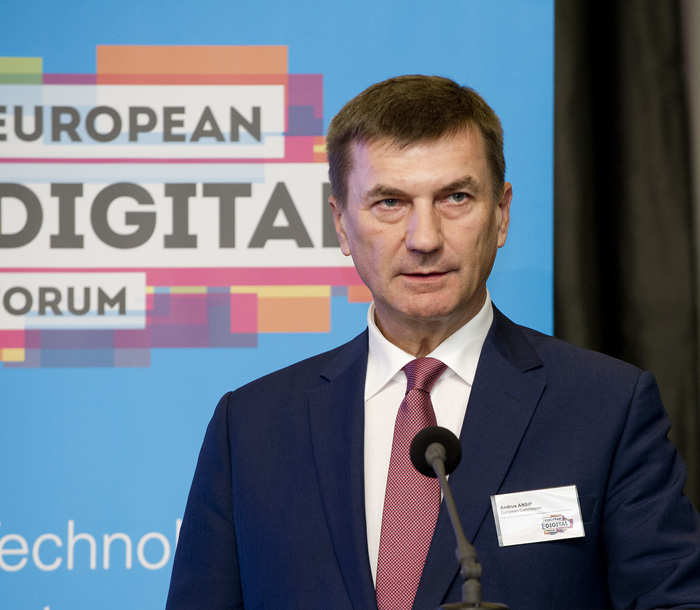 The European Digital Forum participated in the Digital Assembly 2015 â€œOne Europe, One Digital Single Market,â€ the European Union's go-to tech conference, held in Riga, Latvia on 17-18 June and co-organised by the Latvian Presidency of the Council of the European Union. Paul Hofheinz, director of the European Digital Forum, addressed a breakout session on digitising European industry and enterprises and spoke about the link between startups and job creation. 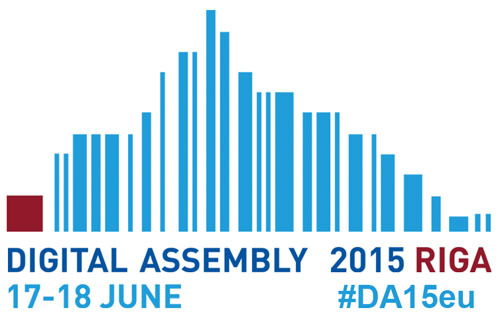 In June, the European Digital Forum welcomed its 1,000th follower on Twitter. The eclectic group of followers and friends is made up of leading policymakers, think tankers, digital entrepreneurs, venture capitalists, journalists, and other stakeholders. 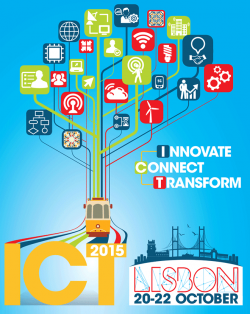 The European Digital Forum will take central stage at ICT 2015 Innovate, Connect, Transform on 20-22 October 2015 in Lisbon, the biggest digital event in the EU calendar. The think tank will host the opening plenary with European Commissioner GÃ¼nther H. Oettinger and a high-level panel of successful digital entrepreneurs, investors and policymakers. It will also convene two other sessions. Based on the enormous success of the European Digital Forumâ€™s sessions at the Startup Europe Summit in Berlin, the think tank will take further two central themes â€“ national startup manifestos, and the role of and opportunities for startups in the rise of new technologies. 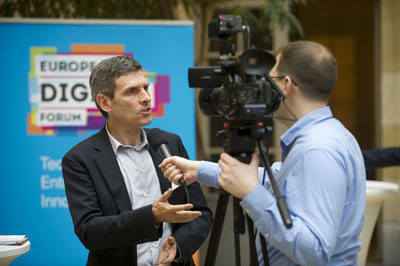 The European Digital Forum will convene the Startup Manifesto Summit this autumn. The Summit will bring together national startup manifesto initiators and writers for an electric exchange of experiences and a visionary discussion for the way forward for European digital entrepreneurship. 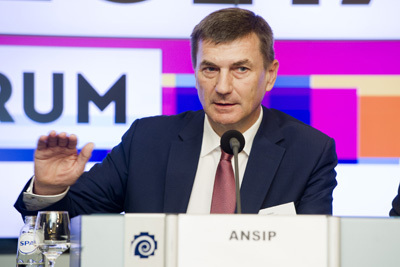 Andrus Ansip, vice-president of the European Commission for the digital single market, who also chairs the Startup Manifesto Movement Task Force, will deliver the keynote. The European Digital Forum is developing a first-of-its-kind index that will measure how friendly European cities are towards digital entrepreneurship. The index aims to provide a holistic and local view of what matters to digital startups. It will describe how well different European cities support digital entrepreneurship, and examine key factors such as the availability of sufficient and appropriate finance, the skillset of the workforce in the area and the quality of the supporting infrastructure and networks. The index will be launched at the ICT2015 conference in Lisbon in the presence of European Commissioner GÃ¼nther H. Oettinger.